American reality TV star Khloe Kardashian sent the fashion and beauty press into a frenzy with the shocking revelation that she has worn a weave for the past 15 years because of hair loss she suffered following the death of her father. Khloe has previously revealed that she experienced thinning hair in the aftermath of her father’s death; this is likely to have been caused by a condition named Telogen Effluvium, which is quite a common condition that often affects people in times of turmoil. A number of things can start the shedding that the condition causes, and the kind of emotional stress that would follow a bereavement is certainly one of them. Others include a change in diet, an intense new fitness regime or following surgery: basically anything which “shocks” the body and causes it to neglect non-essential functions such as correctly maintaining the hair growth cycle. Usually, normal service is resumed in around six months and growth returns to how it was before, but this isn’t always the case. 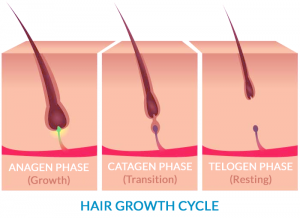 Telogen Effluvium treatment at a specialist clinic can be useful at speeding up recovery, and there is also treatment for Chronic Telogen Effluvium, also known as Diffuse Thinning, which is what the condition is considered to be if it persists for 12 months+. In Khloe’s case, the thinning has previously been described as “Heartbreak Hair Loss”. In normal circumstances, someone who lost their hair as a result of the stress arising from a bereavement might expect it to grow back in six months to a year, so why Khloe says she has been covering up her real hair for more than a decade is a mystery. Never one to miss out on turning her life into a business opportunity, it was interesting to see that immediately following her revelations Khloe announced the launch of her own line of hair extensions and weaves. What is surprising, given that shedding from Telogen Effluvium or Chronic Telogen Effluvium tends to regrow in around 12 months, is just how long Khloe has kept her weave in. From a look at her family tree it appears that androgenetic alopecia runs in the Kardashian family so it is possible that, if the youngest Kardashian sister inherited this genetic predisposition, Female Pattern Hair Loss could have been triggered by the initial stress-related condition. 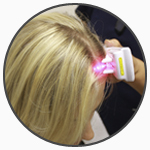 This common, permanent hair loss condition causes a general decrease in hair density as well as thinning across the top of the scalp and at the temples. 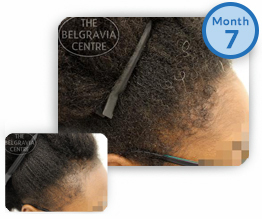 It can often be successfully managed by following a bespoke women’s hair loss treatment course which, at Belgravia, tends to consist of recommended solutions of high strength minoxidil and appropriate hair growth boosters. This approach helps to prevent further shedding whilst promoting healthy regrowth and keeping the hair in good condition. The myth of protective hairstyles is popular in black culture as women – and men – with afro hair have passed the tradition of braiding down through generations. By pulling the hair into tightly woven styles the ends of the hair are tucked away and sew-in weaves or wigs can be attached on top. Both the taut braids and the areas where the weaves are sewn to the hair are often incredibly damaging, however, leading to a condition called Traction Alopecia. This is especially true where black hair is concerned as the afro hair type is naturally brittle and more prone to breakage if not cared for properly. This has lead to a growing movement away from these types of styles and towards natural hair. In an effort to help reduce this type of hair loss in African American women, John Hopkins University released hairstyling guidelines. Whilst aimed at black women, as women of other races adopt these techniques, it is important for them to be aware of the potential damage and hairloss they are risking. It is not just plaited hairstyles, such as the boxer braids Khloe is often pictured wearing, that can cause hair thinning affecting the hairline and temples. High ponytails – another Kardashian favourite, hair extensions and tight buns can also cause Traction Alopecia if worn too regularly. 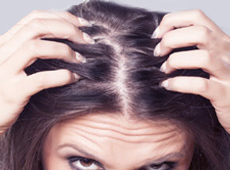 Traction Alopecia is a condition many celebrities experience due to their image-conscious jobs. Stars from Naomi Campbell and Jennifer Aniston to Katy Perry and Ariana Grande have spoken out about how their hairstyles have resulted in hairloss. Khloe’s sister Kim Kardashian West also spoke out about the issue and swore off sew-in hair extensions. These are known to cause hair loss and specialists have raised additional concerns about adverse neurological effects. After announcing she was ‘#extension-free’, Kim later admitted to going back to tape-in extensions. With all this in mind, “fixing” hair loss with a weave would appear to be counter-intuitive and if Khloe still has hair loss, it is possible that her weave, or a combination of her hairstyle choices and genetics, could be to blame. 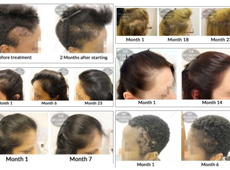 As long as she and her team are mindful of switching up her hairstyle regularly in order to allow the follicles to rest, and, where necessary, use Traction Alopecia treatment or a custom course designed to tackle multiple conditions simultaneously and promote healthy hair growth, it is unlikely to become a permanent issue.